The deck was fairly old (20 years plus). 20 years ago most deck builders used balau as a structure. Over time they have come to realise that a chemically treated pine structure will out last a balau structure because it is chemically treated and therefore it’s behaviour is known. The process of pressure treating is safe and arguably does no more damage to the environment than cutting the purpose grown tree down in the first place. We ended up lifting all these deck boards, numbering them and replacing them in their same position so that we could use the same screw holes. Rather than sliding new joists in below the deck boards. The deck boards themselves where quite mottled with black algae but the wood itself was still ok so we pressure cleaned the deck and then oiled it with a penetrating oil. In some pics you can see the difference between coats of oil. The balustrade is all new as the old balustrade had rotted away beyond repair and had been removed by the client. For a free no obligation quote on your new deck build or deck refurbishment please contact us on 031 – 762 1795 or use the contact us form below. It would seem that most timber decking is taking place in Umhlanga and Ballito in the greater Durban area in 2019. Most other areas have quietened off considerably and I can only assume it is uncertainty in the market. Being officially in recession still, elections looming in May 2019, a new president, load shedding and recent talk of expropriation without compensation has “spooked’ the market somewhat and resulted in cash being held back. This coupled with the broken state of affairs in South Africa for the last 10 years under our previous leadership has led to the market being severely depressed. Nonetheless we put our heads down and soldier on. The advice? Make sure you are dealing with a specialist wooden deck builder when building a wooden deck and make sure you are dealing with a specialist plumber when getting your plumbing sorted. This way you can compare quotes based on the same or similar service. I recently went head to head with another contractor who quoted half my rate on a balustrade. I know what it costs to buy the balau needed for the balustrade and at those rates he was making a margin of about 5%. Really??? Take a spin through our website for various articles, pics and discussion around wooden decking in Durban. Use the contact us form below to get in touch with us for a free no obligation quote or you can call us on 031 – 762 1795. The video here shows the deck we built from the neighbours yard with the mist rolling down the hill in the early morning. Besides being an incredible sight to see one can see how this garden lends itself to a wooden deck. The deck was built square off the house towards the boundary fence which over looks The Valley of a Thousand Hills near the Hillcrest area. On either side at the back of the deck there are stairs that lead back to each side of the house. The deck totalled about 80 to 90 square metres. It was built the standard way we build with a treated pine sub structure and 19 x 68mm yellow balau deck boards. There is a difference between red and yellow balau deck boards. We stock only yellow balau deck boards and use only yellow balau in the building of our decks. The wooden balustrade was our standard vertical picket style balustrade, which is the safest at heights like these, as there are no gaps that exceed 100mm and is therefore compliant in terms of SANS building regulations. The balustrade is at a height of 1.0m. Once you start going higher than about 2 stories it is advisable to build the balustrade at 1.2m for safety reasons. Stairs can either be built as open risers or closed risers. As open risers one can see through them whereas closed risers the underside of the deck is not visible. From a cost point of view they are the same so the choice would be made on whether or not you want to look below at the structure or not. All our decks are finished by filling the counter sunk screw holes with a clear epoxy and saw dust mixture and then sanding flat before oiling with a decking oil. There is an option to leave the deck unoiled and to allow it to weather naturally and turn a grey colour. In the still pic one can how effective lighting is below the capping to illuminate the deck yet not shine in your eyes. These are easy to install in that they are glued below the capping. 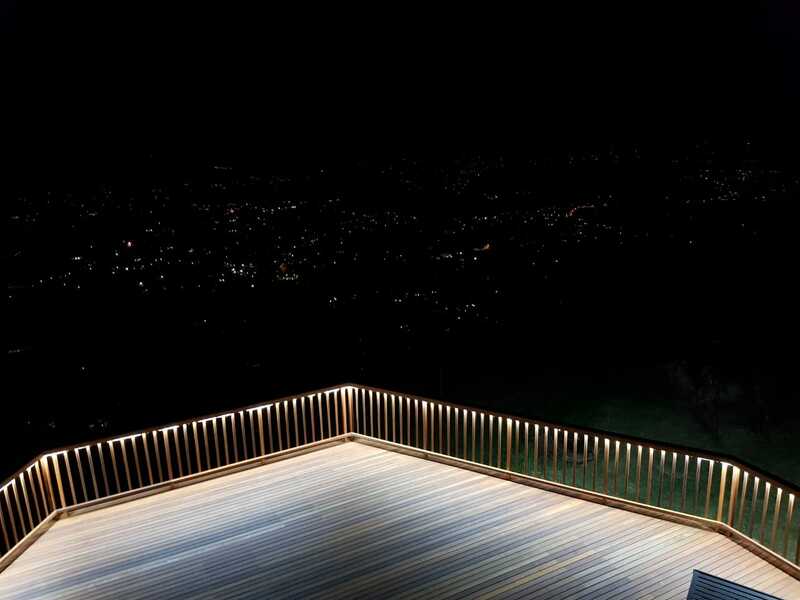 They are LED lights so very little power is used to illuminate the deck surface. For a no obligation quote on your sun deck, pool deck, timber balustrades and other timber related outdoor or indoor construction, please contact us on 031 – 762 1795 or use the contact form below. Here’s a straight forward wooden balau deck we built in Kloof, Durban in October 2018. There were a few angles that had to be cut precisely to finish it neatly but other than that the deck was straight forward to build. We used an H3 and H4 CCA Treated pine substructure. Because the pine is S5 (Industrial SABS approved grade) it is strong enough to be used as a structure for various building purposes. It is also relatively inexpensive in comparison to other hardwoods that could be used as decking structure. Being S5 it contains a certain amount of knots per square metre and is therefore SABS approved as structural timber. Timber with more knots per square metre is normally used as knotty pine ceiling boards where there is very little structural pressures on the timber. Timber with less knots per square metre is referred to as semi clears or S7 grade. S7 becomes quite expensive and is used as deck boards at times to eliminate knots failing on the deck surface. However because one would need to use twice as much wood (38mm thick) when using pine deck boards, the cost is the same as using a 19mm x 68mm balau deck board at half the quantity of wood. As such we use 19 x 68mm yellow balau deck boards as the surface for most of our wooden decks in Durban. The balau is far more stable being twice as dense and hard with a regular straight grain and as such these balau deck boards don’t twist, cup or bow as easily as pine. With the pine being H3 CCA treated it has a life span of at least 50 years outdoors in the rain and weather. We added a small flight of open riser steps to this deck to gain access to the garden. These are done in full solid balau using 30mm stock. Normally the stringers are 30 x 215 and the treads are made of multiple pieces of 30 x 102 with cleats fixed to the stringers and the treads are fixed to the cleats. They don’t work that well in pine as the pine becomes very visible throughout and one ends up cladding it anyway which brings the cost back to the same as solid balau. The alternative to open risers steps is to do closed risers where box type steps are made of pine structure and then clad resulting in the riser being closed. The screw holes of all our decks are counter sunk with a Kalgard decking screw and filled with a clear epoxy and saw dust mixture to match the colour of the wood and then ground flat and sanded smooth prior to oiling the deck. You’ll find other articles on this site where we discuss the pros and cons of using oil vs other finishes available on the market and leaving the deck to naturally grey and weather. If you use the search bar at the bottom right and search for maintenance you’ll find a complete article on deck maintenance. For a free no obligation quote on your wooden deck in Durban and surrounding areas, please use the contact us form below or you can call us on 031 – 762 1795. This wooden deck we built in Waterfall, Durban was part of a new build at Focus on Ithemba along Blessing Ninela Road, Waterfall. They were building a new boardroom and office complex and part of the design was a wooden exterior deck. The job was referred to us by Mass Landscapes, Miles Steenhuysen, who was contracted to do the landscaping. His details can be found here. In consultation with Miles and the project manager we designed the deck so as to flow around this office complex comfortably and aesthetically and within budget. The structure of the deck was the standard H3 and H4 CCA treated pine. H3 and H4 CCA treated pine is suitable for outdoors decks. H3 has a life span of a minimum of 50 years and correctly treated H4 pine can live in the ground in constant contact with wet soil for a minimum of 20 years. These are guidelines provided by www.sawpa.co.za. The full document can be found here. We used 19 x 68mm yellow balau deck boards as the surface. There is a difference between red and yellow balau. The red balau, which is a bit cheaper in South Africa, is a lot more porous and less dense than the yellow balau and as a result will absorb and retain water more easily than yellow balau and will therefore probably rot more quickly. We use only yellow balau which is the most cost-effective hardwood for decking in South Africa. It is not correct to assume that treated pine is cheaper than balau deck boards. Please see here for an article on the difference between balau and pine in decking. The building we were attaching this deck to was not completely square with itself as it was an old building that had been extended. As such one needs to be very careful when building wooden decks against walls that aren’t square or straight. At some point there will need to be a correction to eliminate the problem and it needs to occur where it is less visible. Either the deck can be built square to itself but it will highlight the errors on the building or the deck needs to be built off square to take up any difference between the building and the deck in a place where it is less visible and can be concealed. Screw holes we filled with epoxy and sanded flat. The epoxy used was a clear epoxy which was mixed with saw dust to match the colour. The epoxy in the screw holes prevents water sitting in the counter sunk screw hole and being absorbed up the end grain which would cause rot to set in more quickly. The deck can be oiled after sanding or left to grey naturally. For a free no obligation quote on timber decking and related construction, we can be contacted on 031 – 762 1795 or use the contact us form below. Second hand or Used Balau Balustrade Material available for re-sale in Durban. This balau balustrade has been removed from a site and replaced with another balustrade. The balau wood is still very good as can be seen from the piece that has been machined. It is still in the panels you see in the pics below but can be dismantled by you for use in another project. Below is a link to a pdf file of a list of the pieces that make up the balustrade with sizes and quantities. It is available to view on request. You can use the contact us form below to make contact with me or call me, Garrick, on 082 496 5444.